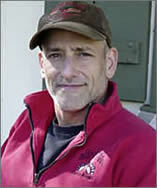 Andrew Klavan (born 1954 in New York City) is an American author and screenwriter of "tough-guy" mysteries and psychological thrillers. Two of Klavan's books have been adapted into motion pictures — True Crime (1999) and Don't Say A Word (2001). He has been nominated for the Edgar Award four times and has won twice. Playwright and novelist Laurence Klavan is his brother. Klavan wrote his first novel, Face of the Earth, in 1977. He then moved to Putnam County, where he worked as a reporter for a local newspaper. His experience covering local crime later formed the basis for his novel Corruption. After Face of the Earth was published, Klavan returned to New York, where he took a series of jobs (as a reader for Columbia Pictures and a news writer for WOR Radio and ABC Radio Networks) while writing mysteries and freelance book reviews. During this time he wrote The Scarred Man using the pseudonym Keith Peterson. His book, The Rain, won an Edgar Award for Best Original Paperback. Andrew's newest novel, a political thriller entitled Empire of Lies, was released on June 19, 2008.